Israeli ground troops battled Palestinian militants in the streets of a densely populated Gaza City neighborhood early Tuesday, destroying dozens of homes and sending terrified residents running for cover as gunfire and explosions echoed in the distance. Israel‘s push into Tel Hawwa neighborhood was the farthest it has moved into Gaza City during its 18-day offensive against Hamas militants, and brought Israel’s ground forces within a mile of the crowded city center. Palestinian hospital officials say more than 900 Palestinians, half of them civilians, have been killed. Israel launched the offensive on Dec. 27 to end years of Palestinian rocket attacks on its southern towns, and Prime Minister Ehud Olmert has vowed to press forward with an “iron fist,” despite growing international calls for an end to the fighting. U.N. chief Ban Ki-moon was headed to the region Tuesday to press for a cease-fire. Palestinian witnesses said the Israeli forces moved overnight about 300 yards into Tel Hawwa, a neighborhood of high-rise buildings on the southeastern edge of Gaza City. Palestinian medical officials reported at least 16 people killed in fighting, though the Israeli army suggested the number could be much higher. One resident, Khader Mussa, said he fled his house while waving a white flag as the Israeli forces advanced. He spent the night huddling in the basement of a relative with 25 other people, including his pregnant wife and his parents. “Thank God we survived this time and got out alive from here. But we don’t know how long we’ll be safe in my brother’s home,” Mussa, 35, told The Associated Press by telephone. Several buildings were on fire, witnesses said, including a lumberyard. Sounds of the battle could be heard clearly around the city of 400,000 as the Israeli forces, backed by artillery and attack helicopters, moved into neighborhoods east and south of Gaza City. Israeli gunboats shelled the coast from the west. 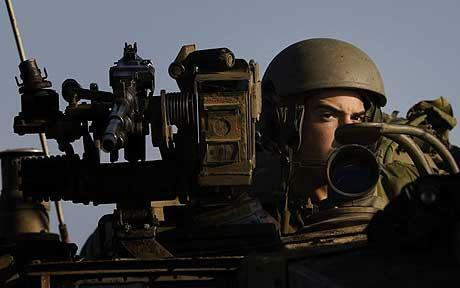 Israel on Sunday battled closer to Gaza City. Hamas resisted in heavy small arms fire. The Israel Defence Forces (IDF) said its air strikes on Saturday night and Sunday morning had targeted tunnels, weapons stores and a mosque that were allegedly used to store weapons. Witnesses told the Jerusalem Post that fighting in the city’s Sheikh Ajleen neighborhood erupted as IDF infantrymen and tanks advanced toward the densely-populated Gaza City. The fighting, on the southwest side of the Hamas-ruled territory’s biggest population center, suggested Israel was intensifying a more than two-week-old offensive. Israel warned of the escalation publically and in leaflets dropped on the area. Hamas and Islamic Jihad said they ambushed the soldiers. Gaza on Jan. 3. At least 12 people were killed, Palestinian health officials said. CNN Reported that the Hamas commander in charge of launching rockets into Israel from the Gaza City area was killed Saturday by Israeli ground fire, the IDF said. 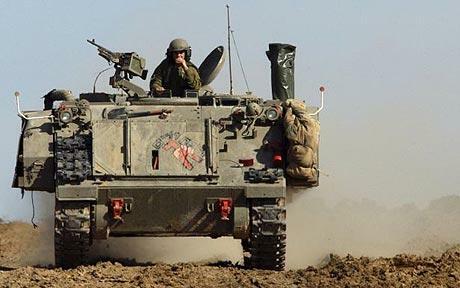 Amir Mansi was spotted firing a rocket Saturday from the Jabel Rise area, east of Gaza City, during a ground force operation, the IDF said. Israeli forces opened fire, killing Mansi and wounding two other Hamas operatives, who were captured, the Israelis said. Mansi was the leading Hamas authority on the Grad long-range missile-launching system, the IDF said. Grad rockets have allowed Hamas to reach farther into Israel than in previous attacks. The BBC said Hamas launched a barrage of rockets on Sunday, two of which struck 42 km (26 miles) inside southern Israel at the city of Beersheba, the military said. There were no reported casualties or damage. Some 820 Gazans and 13 Israelis have reportedly died in 14 days of fighting. Medical staff said 235 children are among at least 820 Palestinians killed in the conflict. Israeli officials also said that Hamas was nearing exhaustion. These statements could be setting the framework for an end to Operation Cast Lead by Israel. But not an end to the long term nature of the conflict. Israel may be close to “the end of the operation” because of a United Nations Security Council resolution calling for an immediate cease-fire, Israeli Deputy Defense Minister Matan Vilnai said Sunday. Israel’s foreign minister Tzipi Livni has declared her country “is not going to show restraint” as its forces close in on the main Hamas stronghold in Gaza. 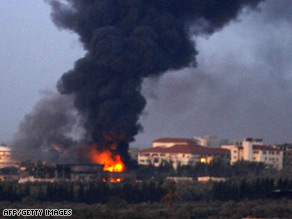 Palestinian militants fired at least 10 more rockets at Israel. As the conflict entered its third week, airstrikes were intensified and Israeli Defence Force (IDF) troops moved deeper into the outskirts of Gaza City, engaging militants in gun battles. With Palestinian medics saying the death toll had risen to more than 780, two Hamas rockets hit the Israeli town of Ashkelon. The IDF killed 15 Hamas fighters some of the most intense close-quarter fighting of the conflict so far, raising the possibility that Israel is preparing for its final push against the militant group’s stronghold. 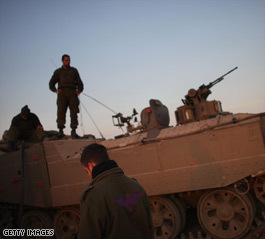 Some of the heaviest clashes took place on a coastal road north of Gaza City, with IDF troops moving to within a mile of the city before pulling slightly back. Although a few hundred Hamas fighters are believed to have died in the fighting, there are thousands more who are thought to be waiting in urban areas to take on the Israeli ground forces. Overnight, Israeli aircraft hit more than 40 targets throughout Gaza, including rocket-launching sites, weapons-storage facilities and smuggling tunnels, a military spokesman said. The renewed fighting followed a failed international attempt to force a ceasefire. 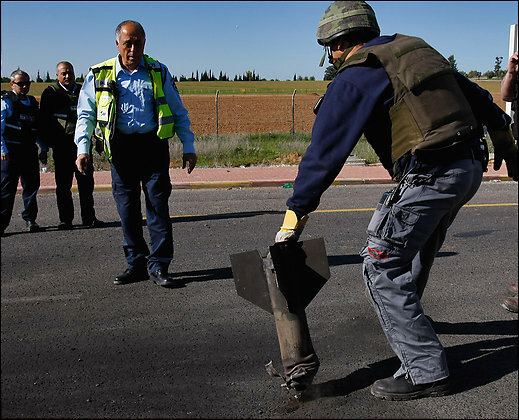 An Israeli police officer in Sderot removes a Qassam rocket fired from the Gaza Strip by Hamas fighters. An Israeli military spokeswoman said Hamas had used tunnels into Egypt to acquire 100 tons of explosives in the past year. 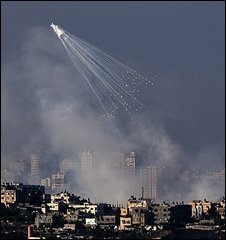 You are currently browsing the archives for the Gaza City category.